Lyle: We'll be working in E minor for now. Let's use this chord to start with. Lyle: Right hand finger markings are: The "p" is your thumb, "i" is index finger, "m" is middle finger, and "a" is your ring finger. Lyle: This is an open E minor chord, using just the 6th, 3rd, 2nd and 1st strings. 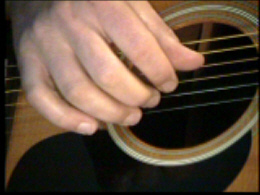 Line up your right hand fingers on those strings and follow the tab. Lyle: Here's a single string E minor scale on the 1st string. This will be part of your first lick which is coming up. Lyle: Try playing these licks along with the looping jam track. Sounds a little like a "Pink Floyd" lick. Ron: Any trick to getting a clean sound. Mine seems some what dulled? Lyle: Ron, are you using an acoustic? Lyle: Might be time for a new set of strings. Old strings sound dull. Lyle: Lick 3 is a little harder than these other licks. Soon your ear will help you recognize the bad notes. Lyle: Notice the difference between the E minor scale and the E maj scale, 3 notes are different, the 3rd, 6th and 7th notes of the E minor scale are lowered by one fret, or "flatted". Now learn the two string shapes again, but for E major. Lyle: All these "licks" are good warm ups for your right hand fingers. Lyle: Remember to try these licks along to the jam tracks. Playing along to a beat will help you keep your timing. Loki: Are you going to tab out the whole intro lick to practice? Lyle: Loki, the whole intro lick is made up of all these licks here tonight! The only thing different in the intro licks is that I played each lick ascending and descending. I think they are in order for the licks in E minor. Lyle: They are E, A, and B chord shapes with droning open 1st and 2nd strings. Lyle: These are great right hand ex. that will help get your fingers in sync. Try to memorize these licks as best you can and use them for warm-ups.